I recently read that a homeowner should expect to budget 1-2% of their home’s purchase price for annual home maintenance. For example, a $300,000 home would cost the average homeowner roughly $3,000-$6,000 annually in home maintenance and renovations. Not only does Top Dog Home Pro aim to provide premier home exterior services in Prince William County, we also aim to provide common maintenance tips to help you save money in the long run. Why should you maintain your gutters? 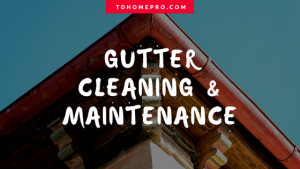 Before getting into the most effective ways to maintain and clean your home’s gutter system, understanding the importance of gutters is a must. 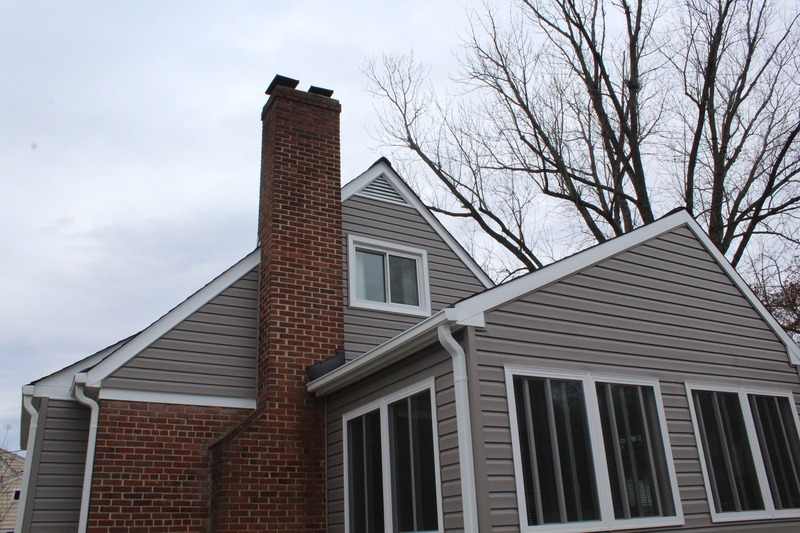 At first glance gutters really don’t seem that important… but they serve a huge purpose. In a nutshell, the main purpose of a gutter system is to channel and funnel water off your home’s roof and a AWAY from the home. Worst case scenario, without gutters, water runoff could erode the soil around the home causing the foundation to possible be compromised. On the lighter side, without a properly maintained and cleaned gutter system, debris accumulation and build up can cause unnecessary stress on gutter fasteners. 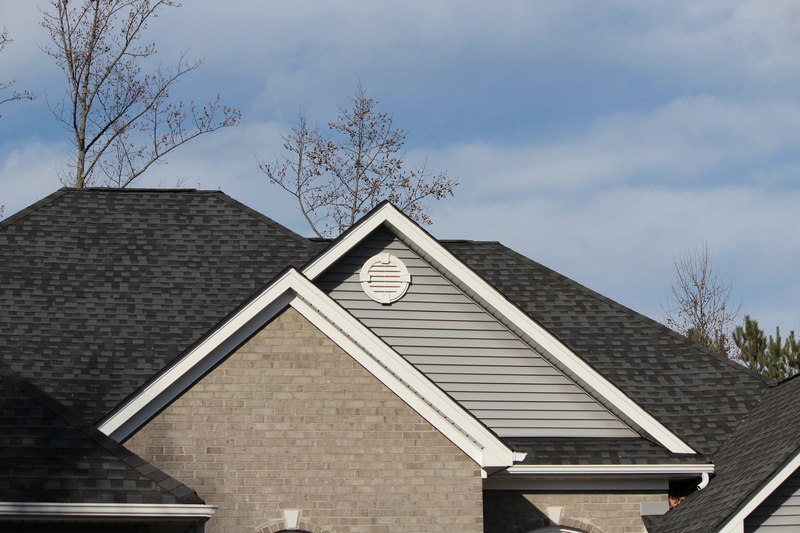 Read up on our Roofing Process here! Recent Example: Debris accumulated at the end of a gutter where it met the home’s downspout. With all the recent rain, the water could not funnel down the down spout, therefore water was running off the corner of the home. This caused the downspout to disconnect from the gutter, and partially detach from the home. One large rain had already started to create erosion on the ground surface below. Simply maintaining and cleaning your gutters 1-2x a year can decrease the likelihood of the gutters detaching from your siding or roof. 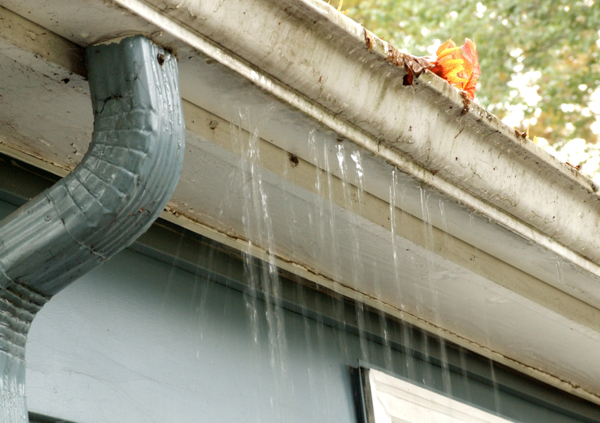 While some of the problems caused by gutters might seem self-explanatory, the others might seem shocking…. Like the mosquitoes. Believe it or not, clogged gutters can result in stagnant water – a perfect breeding ground for mosquitoes. Additionally, water runoff that is not properly funneled away from the home can cause soil shifts that can impact the foundation, walkway, or patios adjacent to your home. However, here is how to simply avoid any of the above mentioned issues. How do you clean and maintain your home’s gutter system? Cleaning gutters in the Spring and Fall. It is safe to assume that if you live in a area where there are more leaf and pine needles debris, such as well-established areas like Reston, Fairfax, Springfield, Woodbridge, Dumfries, etc, you will have debris in your gutters. 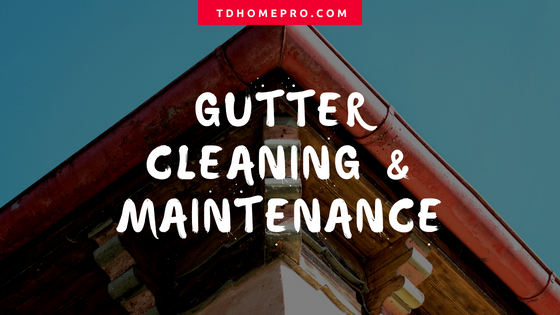 By cleaning your gutters out in the spring and fall, you will prevent any real build-up from severely impacting your exterior home. To clean your gutters, you will need gloves, a hose and most likely a ladder. Depending on the layout and height of your home, this can be an extensive project. Remember to always be safe when getting on you roof, and it is best be to give us a call if you are hesitant about checking your gutters. If cleaning your gutter sounds like a problem or a task you just don’t have the time for, consider installing gutter guards to save time and money in the long run. Sometimes customers think the price of gutter guards might be a little high. However, if you were to take the average single family home gutter guard cost – approximately $1100, and compare that to an annual gutter cleaning – $250, in 4 years your gutter guards pay for themselves. For starters Top Dog Home Pro offers a 20 year non-clog warranty, paired with a 20 year Raindrop warranty. Essentially you save 16 years of cleaning when you use gutter guards with Top Dog Home Pro!! 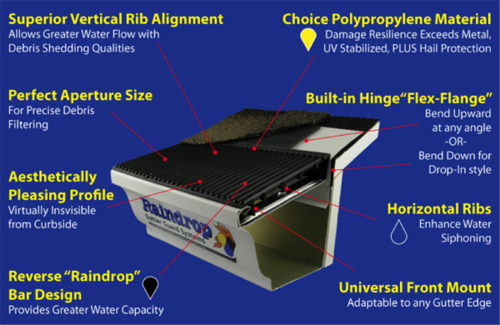 We have teamed up with Raindrop® to deliver gutter protection and make home maintenance easier. The Raindrop® gutter guard fits on every home, roof style and gutter system and is essential in providing a maintenance free & self-cleaning gutter protection system. What makes Raindrop® Gutter Guard stand out from the rest is the system’s capacity to handle any amount of water – from a spring mist to a torrential downpour. Keeping gutters clean and free of leaves using a gutter guard, is an excellent low-maintenance method to protect your home and gutter system. If you have questions about your homes gutters, don’t hesitate to fill out the contact form or just reach out to us on our Facebook page! As the seasons change, a frequent sight is people on their ladders cleaning their gutters. While a gutter’s benefit is immeasurable—protecting the house from water—its cleaning can be less than desirable. Homeowners may consider getting gutter guards, which often provide numerous hassle-free benefits. The greatest benefit of this kind of system is that it helps prevent leaves and debris from blocking rain flow. This can significantly reduce the amount of time a homeowner has to spend on their roof or a ladder. 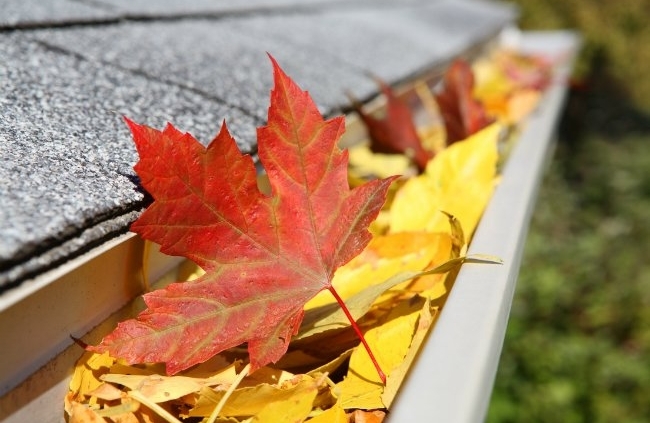 Homeowners typically only need to clean out their gutters every couple years instead of twice a year. Besides not having to get on the roof to clean, they can help reduce the potential for clogs, which may result in overflow down the home. These can lead to leaks in the basement and other rooms, which can create an environment for mold and mildew to grow. It can also impact a home’s foundation. Since gutter guards are typically mesh, vinyl or aluminum sheets placed over the gutters, it keeps out more than just leaves. It may deter birds, insects and small rodents from making a nest. Their design typically results in minimal standing water, which mosquitos love. Longevity is another potential benefit. No standing water can help the gutters age better and reduce rusting. While adding them does have an associated price tag, they often can help the drainage system last significantly longer. This could mean significant long-term savings. In the winter, proper draining can help eliminate a leak from freezing and causing damage. For homeowners in areas frequently battling wildfires, these guards can help protect the home. Dry leaves and other material can ignite easily. This extra layers keeps material from settling, giving a floating ember nowhere to grow. Like any purchase, the decision to install gutter guards requires research. Luckily, there are many professionals who can help a homeowner decide if it is right for their home.